Gloria aeternum quia nostre sanguinem! I plan to explore both the holy and the hidden sides of the temple world. Volume is key to make the game epic enough, so enter the first batch of npc Pilgryms. Bound for Terra. That priest/leader bloke is lovely. Looks like he’s about to call down the fiery wrath of the Emperor upon some unlucky heretics. I second that opinion. The gasmask face coupled with his animated, outstretched hand really convey his religious fervor. The height of all the banners also suggests the importance of their pilgrimage. All told, an excellent group of faithful. 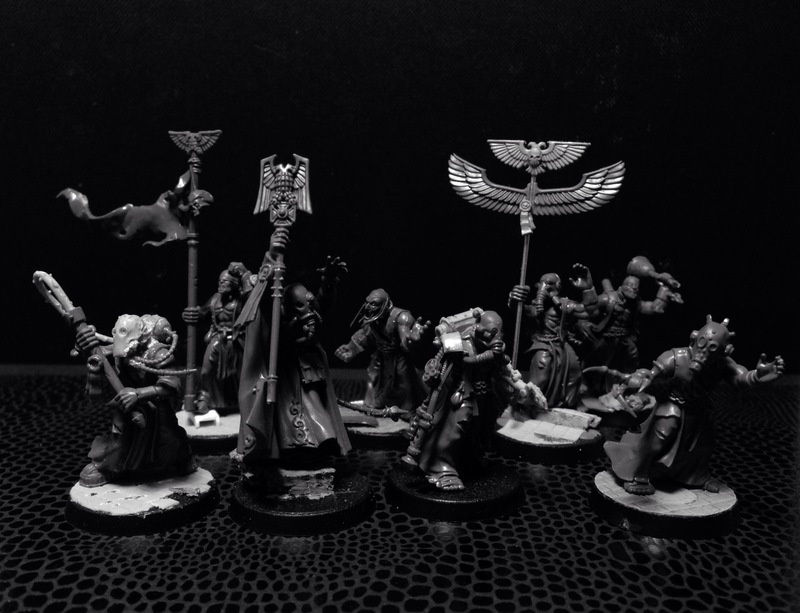 The posing of the empire battle wizards really did quite a lot of the work for me. I’m not a fan of the detailing on those guys, but “conveying religious fervor” is their strongest accomplishment. Couldn’t have said it any better. This is a really great group Toni!! The Aquila banner is my fave. Reminded that plan is to paint all pilgrims predominantly black or white. With brown and other non impactful details. 🙂 this way the factions will stand out nicely. This is wonderful idea, Migs! At one point I started wondering how will the table look like when it is filled with colourful bands of NPCs, houses and other criminal bands. Toning down some/most of the “less” important characters will work very well. Man, they look good… that banner/icon is excellent, and the group composition is 100%… loving this project! Very cool. Love the double winged banner. Excellent group! I can easily imagine these fanatics strolling onwards on terran alleys clanging their bells, chanting prayers with symbols held high. Only thing that catches my eye is the necromancer-head fellow’s arms, maybe a bit too burly? I joined a gym again last week and have been going every other day, so maybe my vision is somewhat distorted! I love this group. The electropriest heads work so well, especially on the guy on the right. There’s a great contrast between the ripped rags and pipes with the clean, symmetrical aquila symbols. Thank you! It will be challenging to make every pilgrim an individual and still a somewhat coherent group.At least we have many artists striving towards a common goal! How many more pilgrims are planned? It’s surprising how well your visions all blend together, distinct yet somehow corresponding. Again, beautiful beyond compare — the Pilgrym project deserves a bound book with all of the pictures and backstory. Toni these guys look fantastic but that banner steals the show. I can just imagine now these guys painted in drab coloured rags while there banner is shining gold. I am so looking forward to starting on my lot. I think I’ll try for more pain and suffering. A glorious bunch of faithfuls Toni!